A huge selection of betting offers; Very helpful customer support via live chat. Only in English; Few payment options. Sportsbet is probably the most visited and respected online sports bookmaker in Australia. This statement isn’t far from the truth since Sportsbet has been in business since 1993 and online since 1998. The bookie is still going adamant, so there must be something (or some things) it’s doing very right. Sportsbet is registered and licensed in the Northern Territory by NTRC – Northern Territory Racing Commission. The Aussie bookie is practically the oldest licensed bookmaker in the country. The business is founded by Matthew Tripp, the son of Alan Tripp. If you are not familiar with Alan – he used to be the biggest bookmaker in the whole of Australia. His son did an excellent job with running Sportsbet. In 2009, Paddy Power acquired 51% of Sportsbet, but the bookie continued as a separate business. Later, in 2011, Paddy Power purchased the whole bookmaker. Tripp remained as a CEO until 2012 and later in 2014 decided to start a new online sports betting website – BetEasy. The design of Sportsbet looks excellent, and the interface is spotless. The bookie decided to use more lively colors – light blue, yellow and white. Everything is easy to find and intuitive to use. 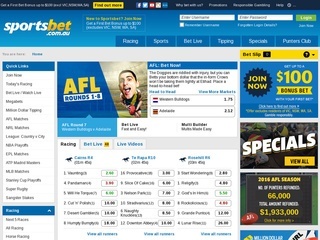 Like most online bookmakers, Sportsbet utilizes the three column structure. On the left side, there are quick links, racing, and sports lists. The middle of the website shows current, live and future matches and races. The left side contains the bet slip and numerous offers and promotions from the bookmaker. The years of professional leadership have done wonders for Sportsbet. Now, the website is in the top 7000 most visited pages in the world and top 70 in Australia. This data means millions of people are visiting the bookmaker on a regular basis. Betting with Sportsbet is a breeze for both newbies and veterans. As most bookies in Australia, Sportsbet brings racing bets to a focus. After all, a bookmaker has to cater to players’ preferences. Since live betting is forbidden on the continent, customers can only bet in real time on sports events, but not racing. Restrictions aside, the horse, harness and greyhound racing markets are splendid and cover most if not all of the races happening in time. Players can bet on their favorites outside of Australia, too. Some of the countries that receive coverage from Sportsbet are France, Sweden, United Kingdom and South Africa. If you are not into racing, do not despair. Sportsbet offers markets for twenty various sports, including Soccer, Tennis, Olympics and Cricket. You can even bet on politics and e-Sports events. The games are plenty, with soccer and tennis dominating the charts regarding games played and covered. The markets in the sportsbook are many and players have lots of choices to bet. Casino games and Poker are not available on the website yet. This is understandable, seeing how the bookie is becoming more and more successful. However, if casino games become more popular in Australia, the website layout might change a bit and add your favorite games. Sportsbet offers smartphone and tablet applications for your leisure. If you are often on the move, the apps will be of great use to you. Customers can download the particular betting platforms on Android, iPad, iPhone and other devices like Nokia, Blackberry, and Windows phones. It’s commendable Sportsbet developed mobile platforms for all types of devices. As you know, racing single bets are go-to for most betting players. However, if you want to show your superiority and grab the big prizes, you should take a look into the exotic bets. Quinella, Exacta, Trifecta and First Four are the highest paying and, of course, hardest to get markets in the racing section. Some people have nearly perfected the art of analysis, but if you want to win big, you have to have a nice amount of luck, too. With Soccer, you can’t go wrong. Most of the covered matches have over 50 available markets you can pick from. The interesting thing here is, that the Australian events have over 100, sometimes over 120 markets to bet on, and you can choose from a vast number of options. The highest paying options are Exact Result, First Goalscorer, and the various Handicaps. Sportsbet utilizes the latest in SSL technology. The encrypted connection is secure, and your information is safe from harm. The customer service of Sportsbet is excellent and very responsive. You can contact the department by phone, live chat or e-mail. As with most Australian bookmakers, you can bet on live races by phone every day, at all times. You can see the details on the table. Players can deposit money into their Sportsbet accounts using some of the most popular systems, including the primary card suppliers and e-wallet platforms. Withdrawing is done the same way and happens fast and easy. The details are in the table on this page. The online bookmaker accepts only two currencies, but that shouldn’t be a problem for people living on the continent. Sportsbet offers a gift up to $100 with your first bet. 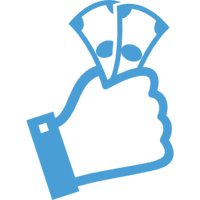 Aside from this bonus, there are numerous extras, like early payouts and money back specials. The promotions are stable, and you should give this Australian bookie a try!